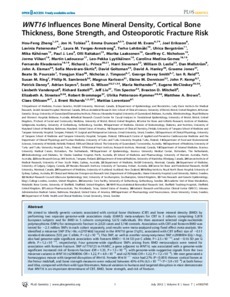 We aimed to identify genetic variants associated with cortical bone thickness (CBT) and bone mineral density (BMD) by performing two separate genome-wide association study (GWAS) meta-analyses for CBT in 3 cohorts comprising 5,878 European subjects and for BMD in 5 cohorts comprising 5,672 individuals. We then assessed selected single-nucleotide polymorphisms (SNPs) for osteoporotic fracture in 2,023 cases and 3,740 controls. Association with CBT and forearm BMD was tested for ~­2.5 million SNPs in each cohort separately, and results were meta-analyzed using fixed effect meta-analysis. We identified a missense SNP (Thr>Ile; rs2707466) located in the WNT16 gene (7q31), associated with CBT (effect size of -0.11 standard deviations [SD] per C allele, P = 6.2 x 10-9). This SNP, as well as another nonsynonymous SNP rs2908004 (Gly>Arg), also had genome-wide significant association with forearm BMD (-0.14 SD per C allele, P = 2.3 x 10-12, and -0.16 SD per G allele, P = 1.2 x 10-15, respectively). Four genome-wide significant SNPs arising from BMD meta-analysis were tested for association with forearm fracture. SNP rs7776725 in FAM3C, a gene adjacent to WNT16, was associated with a genome-wide significant increased risk of forearm fracture (OR = 1.33, P = 7.3 x 10-9), with genome-wide suggestive signals from the two missense variants in WNT16 (rs2908004: OR = 1.22, P = 4.9 x 10-6 and rs2707466: OR = 1.22, P = 7.2 x 10-6). We next generated a homozygous mouse with targeted disruption of Wnt16. Female Wnt16-/- mice had 27% (P < 0.001) thinner cortical bones at the femur midshaft, and bone strength measures were reduced between 43%-61% (6.5 x 10-13 < P < 5.9 x 10-4) at both femur and tibia, compared with their wild-type littermates. Natural variation in humans and targeted disruption in mice demonstrate that WNT16 is an important determinant of CBT, BMD, bone strength, and risk of fracture.